Check out our range of fun koala facts for kids. Learn where koalas live, what they eat, what a baby koala is called and much more. Read on and enjoy a variety of interesting information about koalas. Koala fossils found in Australia have been dated as long ago as 20 million years. 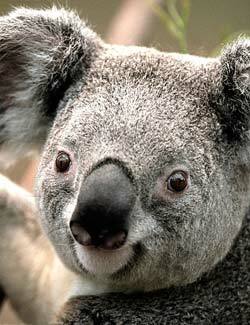 Koalas eat eucalypt leaves and almost nothing else. The closest living relative of the koala is the wombat. Koalas have sharp claws which help them climb trees. Outside of breeding seasons, koalas are quiet animals. A baby koala is called a ‘joey’. Joeys live in their mother’s pouch for around six months and remain with them for another six months or so afterwards.